The leaves correspond to elements and the letters indicate the type of those elements. If we read the leaves from left to right they match the regular expression A*B*. 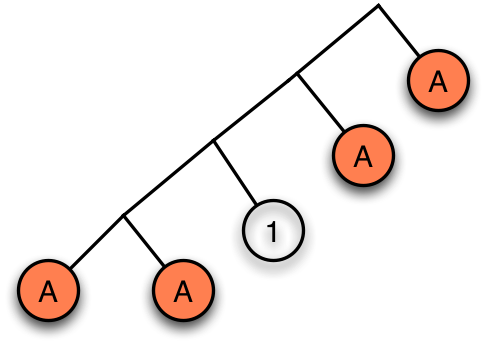 We can define a binary type whose leaves always match this string by making use of dissections. Similarly we can construct all kinds of other structures, such as lists and more general trees, whose leaves match this expression. 2. Structures that match (AA)*. These are structures like trees with an even number of elements. This is easy for lists. We can just use a list of pairs. 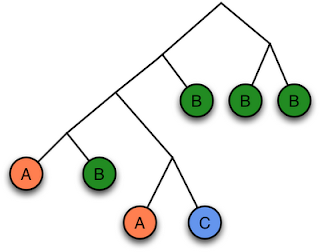 But it's more complex for trees because subtrees may have odd or even size even though the overall structure is even in size. We could also generalise to ((AA)n)* for some fixed n.
4. A bytestring- or rope-like type used to represent a string that is statically guaranteed to match a given regular expression. 5. Many kinds of other constraints you could imagine on a datastructure. Like trees which are guaranteed not to have two neighbouring leaves of the same type, or whose sequence of leaves never contain a certain subsequence. So the challenge is this: can we implement a uniform way of building any container type to match any regular expression we want? Note that I have overloaded the numeral '1' to mean both the type with one element (when labelling an edge) and to mean the state numbered 1 (when labelling a vertex). Let's also define the matrix L(x)= (Lij(x)). where the sum is over all the places we might visit on the first step of the journey from i to j. In other words, the usual Leibniz rule for differentiation is nothing more than a statement about transitions for the automaton I drew above. To get a transition 0→1 you either go 0→0→1 or 0→1→1. Although I talked specifically about differentiation, much of what I said above applies for any finite state automaton whose edges are labelled by types. The best thing now is probably to put together some code to see how this all looks. If you haven't checked Brent Yorgey's solution to my problem last week, now is a good opportunity. My code is a generalisation of that but it may be helpful to look at Brent's specialisation first. Think of ListF being a bifunctor taking arguments X and Y.
I'm using In to represent the integer n at the type level. to define the second divided difference of trees. x0 is the empty list. x1 is the list . The Left and Right get a bit tedious to write. But this is intended as a proof that the concept works rather than a user-friendly API. > iso1' (Fix (Right (Right a)))      = error "Can't be called as a is void"
So that's it! If we can write our container as the fixed point of a polynmomial functor, and if we can convert our regular expression to a finite state automaton, then Fix completely automatically builds the constrained container type. This matrix has the property that its square is zero. It's the 'infinitesimal type' I described here. In other words, this is type-level automatic differentiation. We've also been doing type-level automatic divided differencing. In fact, we can use what we've learnt about regular expressions here to solve some numerical problems. But I won't write about that until the next article. By the way, I think what I've described here can be viewed as an application of what Backhouse talks about in these slides. I think that for any automaton we have a 2-category. 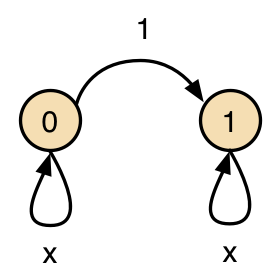 The 0-cells are states, the 1-cells are the types associated with paths from one state to another, and the 2-cells are functions between types that respect the constraint. I haven't worked out the details however. 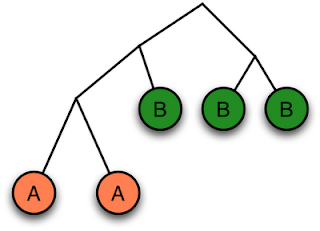 The 2-category structure is probably important. As things stand, I've just shown how to make the types. But we don't yet have an easy way to write functions that respect these constraints. I suspect 2-categories give a language to talk about these things. But that's just speculation right now. By the way, I couldn't write a working Show instance for Fix. Can you write one? And an implementation of arbitrary for QuickCheck? And I hope you can now solve my problem from last week. K22 and K33 are constructors for 2×2 and 3×3 matrices. It would probably have been better to have used lists like Brent did. I think you've found a bug in the construction of circular typeclass dictionaries when type families are involved. Thanks for putting in the work to isolate the problem. You going to report it? I found it a bit confusing that you used D in the definition of List. I guess it was just an example. type List x = Fix (I0, I0) (K11 x) ListF works as well for the obvious definition of K11, with a level of Either a Void less in the values. Well you can't define List' this way without a version of List coming out too :-) Hope it all still makes some kind of sense. > iso1' (Fix (Right (Right a))) = error "Can't be called as a is void"
Oh, I misunderstood. The code *is* passing my tests. The error message is due to the other annoyance I'm having with ghc: I don't know how to make it fully reduce types in its error messages. That type *is* Void, once fully reduced. As for the bug i think it's the same problem as http://hackage.haskell.org/trac/ghc/ticket/3500 , i've left a comment there. Nice. It seems this scheme could not only be but used to restrict data in a regular fashion (trees, etc) but also code (monadic operations, protocol sequences, etc.). I.e. here another excercise: apply this scheme to model "session types". Thanks for the agda version. It'll help me to learn the language. Desc is a datatype of descriptions for plain polynomial functors, but i see in the post you already have Hom for your functors, which is pretty close to what you'd need. This version typechecks, it seems the positivity checker can't see through the module boundary, maybe it'd pay to use "Indexed Containers". > The error message is due to the other annoyance I'm having with ghc: I don't know how to make it fully reduce types in its error messages. In GHCi 7.4 there is a :kind! command that reduces a type. The link to McBride's paper on dissections is dead. The paper can be found at his University of Strathclyde site.